Allie is using Smore newsletters to spread the word online. A little boy named Bruno lives a rich life in Germany along with his mother, older sister, and father. The family relocates to the countryside where his father is assigned to take command a concentration camp. A few days later, Bruno becomes friends with another young boy. 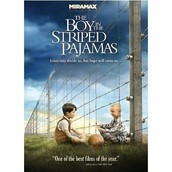 The boy was strangely dressed in striped pajamas. His name was Shmuel. Shmuel lives behind an electrified fence. Bruno soon finds out that he is not allowed to be friends with his new friend because Shmuel is a Jew and Bruno is a German. Also, he finds out that the yard that Shmuel in a concentration camp and Shmuel is a Jews that will soon be killed. Difference doesn't matter, friendship comes first. Shmuel and Bruno don care that they are different, Like Shmuel is a Jew and Bruno is a German. Shmuel also didn't care that Bruno's dad was a Natzi they were still friends no mater what. Bruno did a lot for Shmuel like he bought him food, he snuck him out, and he went in to the camp to confert him. In this story there are many things that are fiction and so many things that are non fiction. One non fiction thing is that back then they put a lot of children in gas chambers and killed them. Also, back then Jews and Germans did not like each other. Some fiction things are that the boys (Bruno and Shmuel) are not real children and nither are there family's. If they are not real then the friendship between them is not a true friendship.